Laparoscopic Technique for the Treatment of Hematocolpos Due to an Obstructed Uterine Horn. A uterine malformation is a type of female genital malformation resulting from an abnormal development of the Mullerian ducts during embryogenesis. The prevalence of uterine malformation is estimated to be 0.4% in the general population. Young females, with Mullerian duct obstruction may present with abdominal pain, palpable mass and dysmenorrhea. If the patient is not treated in a timely fashion, the consequences can be severe, extending even to infertility. We present a case of 14-year-old female who initially presented with an abdominal pain and was found to have fluid filled uterine horn on the abdominal ultrasound. MRI showed an obstructed functional right uterine horn containing blood degradation products with no communication with the cavity of the normal left uterine horn. Surgical treatment with laparoscopic removal of the obstructed uterine horn was performed without any complications. 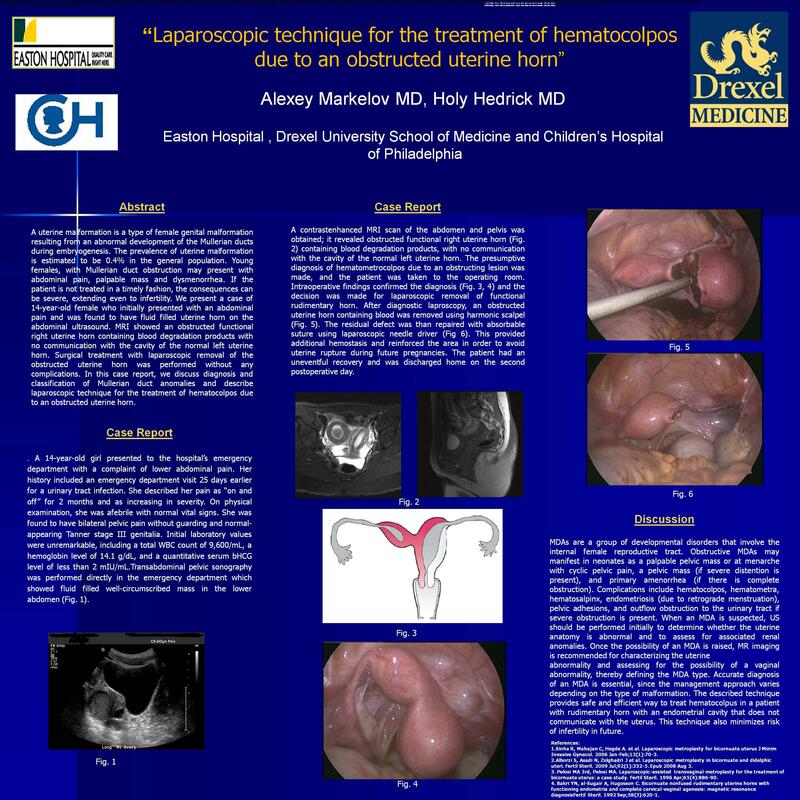 In this case report, we discuss diagnosis and classification of Mullerian duct anomalies and describe laparoscopic technique for the treatment of hematocolpos due to an obstructed uterine horn.